It wasn’t only Timberland Regional Library patrons who benefited from a blogging workshop by Kelly Wallace, a writer and entrepreneur from Portland spending part of August in a residency at Holly House. Kelly Wallace shows board member Colleen Keoski how to add a photo to her blog entry. Several board members learned how to navigate the complexities of blogging via WordPress in an evening workshop with Kelly. 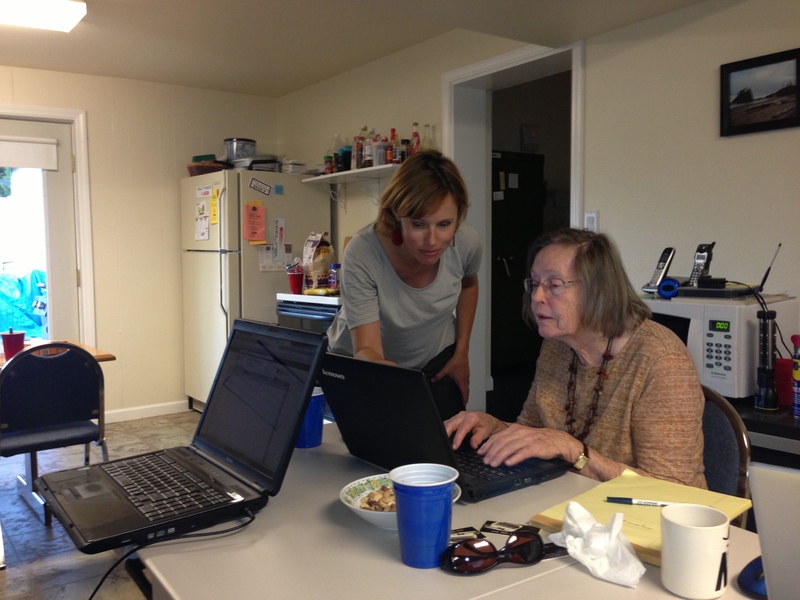 Working with the Hypatia-in-the-Woods website, board members learned how blogs should feature regular postings, include current events for Holly House and the organization as a whole, and focus on aspects of Holly House and Hypatia-in-the-Woods as well as the local community. They learned about keywords and tags, which are ways to draw traffic. They learned how to insert photos (and how not to), and discovered the uses of links. While at this point the main mission of Hypatia-in-the-Woods is maintaining Holly House as a place for women in the arts, academia and entrepreneurship to spend time apart to finish (or begin) a project away from the distractions of everyday life, another of its goals is to enrich the local community with workshops, classes and programs. In the past year, Hypatia and the Shelton Timberland Library have enjoyed a cooperative project offering readings, workshops and programs by Holly House residents to the wider community. But this time around, the board enjoyed its own workshop. Thanks, Kelly!